Experts discussed paths to peace as tensions mount between the two countries. This policy, known as the Perry Process, “has been violated with terrible consequences,” according to the man after whom it’s named, former U.S. Defense Secretary William Perry. At a daylong conference at the George Washington University’s Elliott School of International Affairs, “Paths to Building Peace with North Korea,” the former cabinet member, now a senior fellow at Stanford University, shared the personal history and beliefs that inform his judgment on how the United States should deal with North Korea. Christine Anh, the international coordinator of Women Cross DMZ, which is an organizational member of the Korea Peace Network, introduced Mr. Perry. He was one of two keynote speakers at the event sponsored by the Institute for Korean Studies and the Partnerships for International Strategies in Asia. “He is the closest I’ve come to the embodiment of a peace agreement,” said Ms. Anh, referencing the non-aggression pact and missile deal negotiated during the Clinton administration. His first crisis as defense secretary was with North Korea, he said. By 1997, he had left the Clinton administration. The president asked Mr. Perry to return as a special envoy when the United States came close to war with North Korea, which was building long-range missiles and on the brink of scuttling a nuclear freeze agreement. Mr. Perry said we have to understand North Korea’s problems and work with them as equals. North Korea’s first and foremost objective, he explained, is sustaining the Kim Dynasty. The second is to gain international respect. While building its economy is important, he said, North Korea would sacrifice it to sustain the regime. Bruce Cumings, University of Chicago professor of history and an expert on modern Korea and U.S.-East Asian relations, was the second keynote speaker. Dr. Cumings provided a framework for understanding the fraught history of the United States and North Korea. He noted that in the 70 years since North Korea was established, the United States has failed to lift sanctions against the country or recognize it. He pointed out that few Americans paid attention months ago to celebrations in Pyongyang of North Korea’s 85th anniversary of armed struggle against the Japanese that led to its independence in 1945. But it’s a moment in which the North Koreans take great pride. The fighting continued after World War II, and the Korean peninsula was divided, the Soviets siding with the north and the United States backing the south. The U.S. Air Force devastated North Korean cities in the conflict that resulted in the loss of millions of lives, including more than 30,000 U.S. troops. “Everything we have tried has failed except for direct talks with North Korea,” he said. Talks between the two countries seemed most hopeful when the Clinton administration and South Korea’s President Kim Dae-Jung worked together on engagement with North Korea President Kim Jong-Il. It led to tens of thousands of Koreans traveling back and forth between the north and south to visit family members they had not seen since the war. 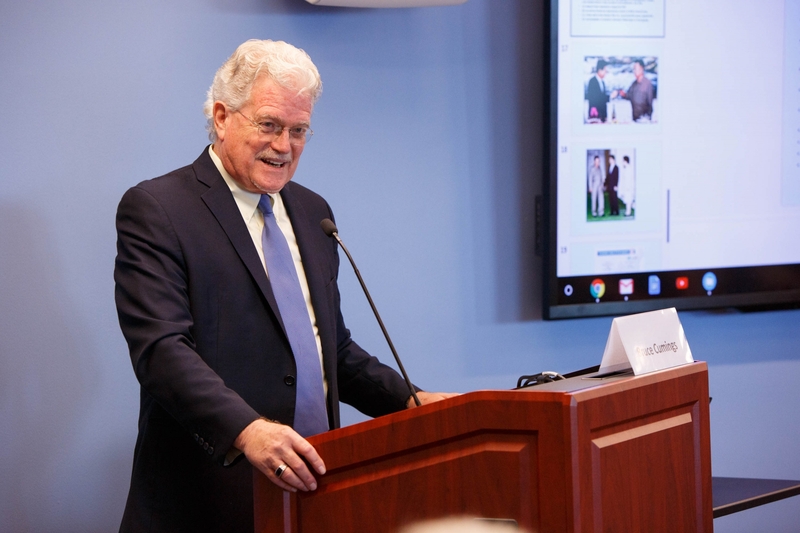 “Kim Jong II really responded in a way no North Korean leader had, particularly by normalizing relations with a number of countries and expanding diplomacy,” Dr. Cumings said. That period of collaboration led to an agreement with the United States that neither side would have hostile intentions toward each other and a missile deal. The progress wasn’t supported by Republicans in Congress and was broken off when President George W. Bush was elected. In 2002, Mr. Bush identified North Korea as part of an “axis of evil,” along with Iraq and Iran. North Korea resumed production of plutonium and the development of nuclear weapons. Both Dr. Cumings and Mr. Perry see no prospects of North Korea giving up nuclear weapons now that the country has them. If the United States is going to negotiate it needs a strategy that offers incentives and disincentives, he said, in the form of trade, security and respect. He said the United States should involve China, which provides North Korea with food and fuel. Ribbon-cutting and inaugural conference on humanities and the Korean diaspora mark opening of new institute.